Despite Cyber Monday being the designated “online shopping holiday,” consumers are far more interested in beating the lines at dawn and shopping in their pajamas on Black Friday with their in-store cohorts. This comes as no surprise to retailers, who began pumping up the volume of their campaigns starting on Thanksgiving and peaking on Black Friday itself. While email sends were at the second highest on Cyber Monday, Black Friday continued to be the highest grossing day. 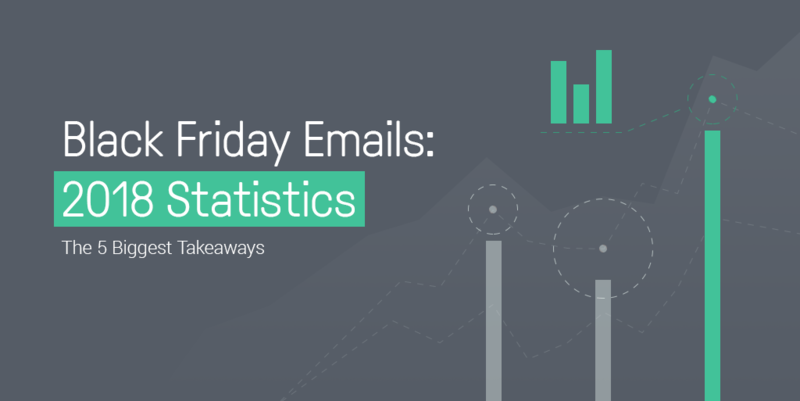 Black Friday was responsible for over 40% of the weekend’s email campaigns, with an average order count of 9.44. 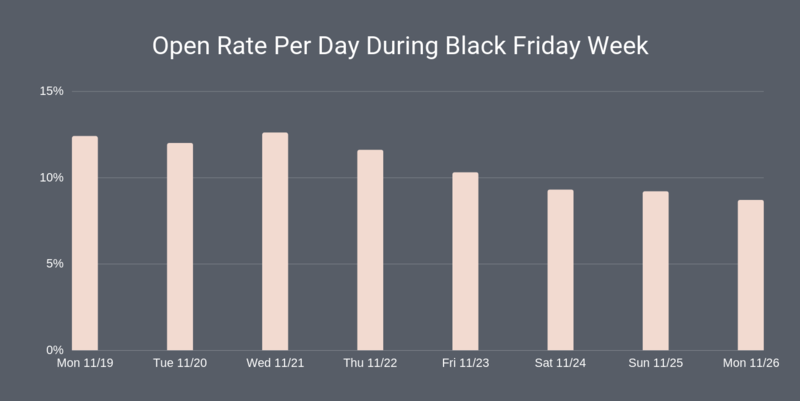 Open and click-through rates fell slightly on Black Friday (mainly due to the sheer volume of emails being sent), and despite Cyber Monday bringing in 30% of the weekend’s email campaigns, Cyber Monday only brought in a 5.56 order count. Consumers were less ready to buy on Cyber Monday than they were on Black Friday or even Thanksgiving itself. Is this the beginning of the end of Cyber Monday? It might be worth it to focus on the Monday before Black Friday. We’ve seen that holiday shopping starts earlier and earlier each year, with many consumers starting their shopping around the end of October. 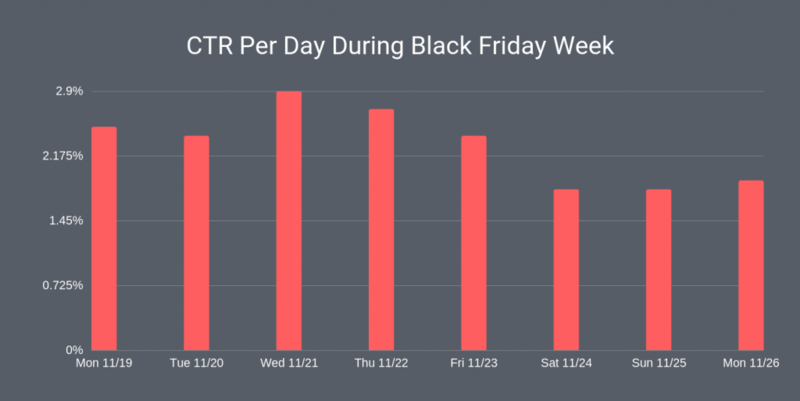 We can see that open and click-through rate is significant in the days leading up to Black Friday. Even on Thanksgiving, consumers purchased nearly as many products online from email campaigns as they did on Black Friday. However, the weekend in between Black Friday and Cyber Monday drops off to nearly normal rates, despite many being off work and having more time to shop. Consumers won’t wait for Black Friday- and they’re already susceptible to deals well before Black Friday even starts. Try sending your campaigns a bit earlier next year, rather than sending everything on Black Friday alone. 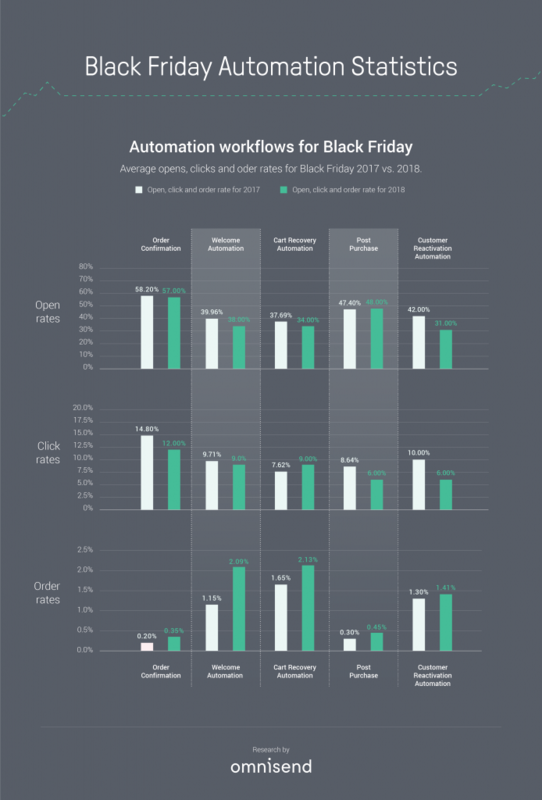 We also studied automated email workflows used during the holiday period and we found some interesting Black Friday statistics. 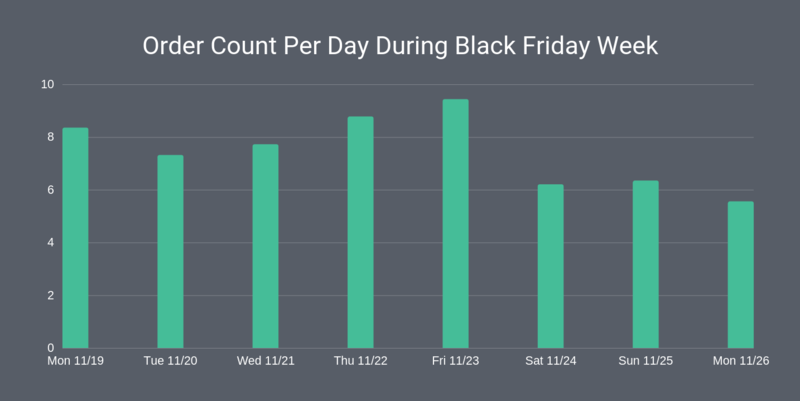 As in 2017, cart recovery emails had the most success during Black Friday weekend. Boasting a 34% open rate and a 9% click-through rate, 2.13% of all cart recover emails opened resulted in a purchase. The biggest takeaway from this? Customers have a lot of deals to sift through on Black Friday. Call them back to their abandoned carts with a well-timed recovery email to close that conversion. While cart recovery was particularly successful, the next category of successful automated emails might surprise you: welcome emails had considerable success across the board. But of all the emails sent, why would welcome emails be so successful? This exact scenario happened to me on Black Friday: If you’re like me, I use Google when I have an idea for a gift. When I find a store that offers me something to sign up, say a pop up with a first-time discount, I’ll definitely sign up. After all, why wouldn’t I want a discount on top of already discounted products? I then clicked through from the welcome email and used my discount code to pick up the gifts I was likely going to buy anyway. Many consumers are not only clicking through the campaigns of the stores they love, they’re also open to finding new stores to shop from. So keep a 360 degree strategy for new visitors- pop up email capture OR exit intent, automated welcome emails, cart abandonment emails, etc to keep your customers’ attention. A surprising contender this shopping season was SMS campaigns: according to our Black Friday statistics, SMS messages were sent 33 times more on Black Friday alone compared to a typical business day..
We’ve known that 94% of all SMS messages are read within the first 5 minutes, and that by 2020, the number of people subscribed to SMS marketing will reach nearly 50 million. In 2018, our merchants took the plunge and chose to use SMS marketing to boost their campaigns. Across our customers, we’re also seeing the wave of SMS-love from Black Friday: many spoke out saying that they were seeing 2000% ROI, and even up to 3300%! For nearly 3300% ROI, it’s definitely worth jumping on this trend. If you keep your SMS campaigns few, far between, and well-timed, they can really impact the success of your email campaigns. 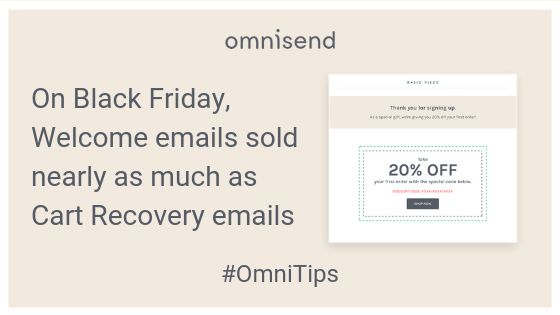 At Omnisend, despite sending in regular campaigns, we suggest adding them to a workflow for cart abandonment and reactivation sequences. While we weren’t expecting such large hikes across our 2018 Black Friday statistics, we weren’t shocked by any means. Online merchants are quick to jump on new ways of connecting with their customers, and they know when their shoppers are the most susceptible to deals. These are tactics we can use throughout the rest of the holiday season and the whole 2019 year. 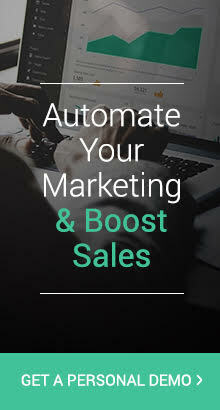 By kicking up your marketing efforts in the days leading up to shopping holidays, and by not pulling any punches on which channels you use, you can see amazing results from your holiday weekend’s profits. What Black Friday statistic shocked you the most? Anything you weren’t expecting? Tell us below! Thanks so much! I’m glad it could help! …they were seeing 2000% ROI, and even up to 3300%! How is this possible when the app doesnt give you any sales results figures from the sms campaigns. I would love to know we achieved a 2000% ROI… we might have, we might not… there was no way to know if I was wasting money sending text messages out because omnisend DOESNT give any results when it comes to SMS campaigns. This needs an urgent fix please. We were able to track this a bit with customers who use Shopify Marketing Events for sales attribution. 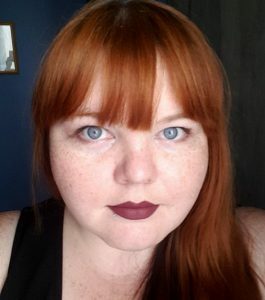 But you’re absolutely right- you should have metrics for this because you can’t make good marketing decisions without knowing what kind of ROI you’re getting. I just want to let you know that we’ve noticed this from our end too, and we should be releasing SMS, push notification, and Facebook Messenger sales tracking in Q1 of this year. Your feedback is valid- and as always, appreciated. Thanks so much for reaching out.